The Bichon Frise is a small, sturdy, white powder puff of a dog whose merry temperament is evident by their plumed tail carried jauntily over their back. The Bichon's coat puffs out all over, rather thatn hanging down. They are small, sturdy dogs that are slightly larger than a Maltese. The ears are high on the head and drop down , if ever you could see them in the poil frise (curly coat). Bichon Frise (Bichons) love to be the center of attention and are always eager to please. This Tenerife Dog is a bouncy, friendly dog that will exercise with their owner to the end. Bichons are perky, playful and friendly to all. They are affectionate, responcive, and are apt to cuddling. They make a delightful and amusing companion. Used in the show ring often, their coats require much grooming and intricate care to maintain the accepted puffy appearance. Bichon a poil Frises can often be seen doggy beauty parlors. Although they are small and appear high maintenence, Norwegian farmers have recently discovered that this breed can be trained to round up sheep! The Bichon is also free of skin problems, as many small white-haired dogs are not. 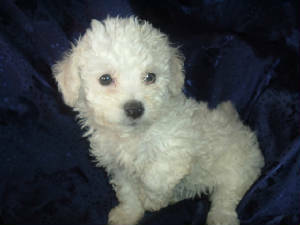 Gentle-mannered, msensitive, and very playful the Bichon Frise is good with children and other pets. Colors: white, cream or apricot up to 18 months of age. Can be buff, cream or apricot around the face and ears, but all white is desirable. Coat: Long and loosely curled, puffing outward from the body all over, rather than hanging down. Their coat is double layered, and there is a profuse amount of hair on the head, beard, mustache, ears and tail. 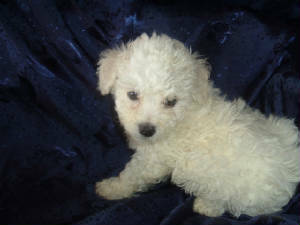 Temperament: Bichon Frise are friendly, active, gentle-mannered, playful, energetic and willing to cuddle. They can be very adaptable, bold and lively. The Tenerife Bichon is responsive, sensitive, and loves to play. They tend to bark, even in the house. They may also be difficult to housebreak as they can be stubborn, but they are also known to be patient dogs. Sometimes when they are happy they will "zoom" or "blitz", in which they run in circles from a sudden burst of energy. with children: Yes, exceptionally good with children. The Bichon Frise does very well with in family environment. with Pets: Yes. Bichons are very willing to play with other animals, even dogs twice their size. Watch-dog: High. These dogs are aware of their surroundings, and may bark a lot to get attention or to warn. Guard-dog: Very Low. Bichon Frises are very small dogs that are friendly to everyone, and are therefore likely to play with bigger animals or strangers rather than fight them off. Care & Training: The Bichon Frise requires daily coat care. These Tenerife Dogs require brushing, periodic trimming, regular bathing. Trim around the eyes and ears with blunt nosed scissors. Clean the eyes to prevent staining. Cleaning gums and teeth is important as well, as Bichons tend to acquire tartar and gum infection. 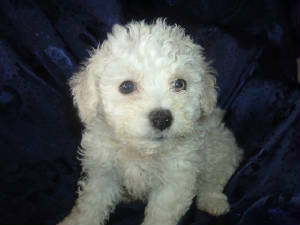 Tenerife Bichons arre also hypoallergenic. For the show quality grooming, a specific hair cut is required by groomer. As for simply pet-owners, the "puppy cut" will suffice. Most of their exercise needs can be met with just playing, but they do love to walk and romp in open areas. Bichon Frises will exercise as long as the owner can stand, and are happy to do so. Learning Rate: Very High. Obedience - High. Problem Solving - Very High. Activity: Outdoors - Medium. Indoors - Very High. Bichons are very high energy and require much attention from their owner. They will run and play for quite a while. Living Environment: An apartment is fine if daily walks are given. An owner of a Bichon Frise should be patient, consistent and be able to take time to train, exercise and socialize them. Bichon Frise do well with the elderly or disabled, as well as children. Bichon Frised are very good family dogs. Health Issues: Bichon Frises are fairly healthy dogs, but some common health concerns include luxating patellas, bladder problems, block tear ducts, skin ailments, cancer and autoimmune disease, as well as cataracts and epilepsy. Life Span: 12-16 years, altough somne have been known to live up to 21 years. History: The exact origion of the Bichon Frise is still unknown today. Though many agree that they existed before the time of Christ. In the fourteenth century, Italian sailors took the little dog from the shores of Tenerife, one of the Canary Islands, and bought it back to France to barter with. Some say they descend from the Maltese, which have been on record as long as the Bichon, and others claim they were a dwarf breed that results from crossing of a miniature Spaniel and a miniature Poodle with Cayenne dogs. For 400 years the Bichon Frise enjoyed life among kings and aristocrats in France in the 1500s. But in the 1800s the little dog became a common pet among people and sometimes served as an organ grinder's dog or as a circus performer. After World War I both French Kennels Club. The breed was brought to America in 1956, and popularity was on the rise. In 1971 the breed recieved recognition from the AKC in the Miscellaneous Class. A challenge came when it was time to name the breed. Madame Nizet de Leemands, head of the breed Standards Committee of the FCI asked her colleagues in desperation, "What does it look like?" She was told it was a fluffy, little white dog. "Well then,"she said, "It shall be called Bichon Frise (fluffy little dog)."